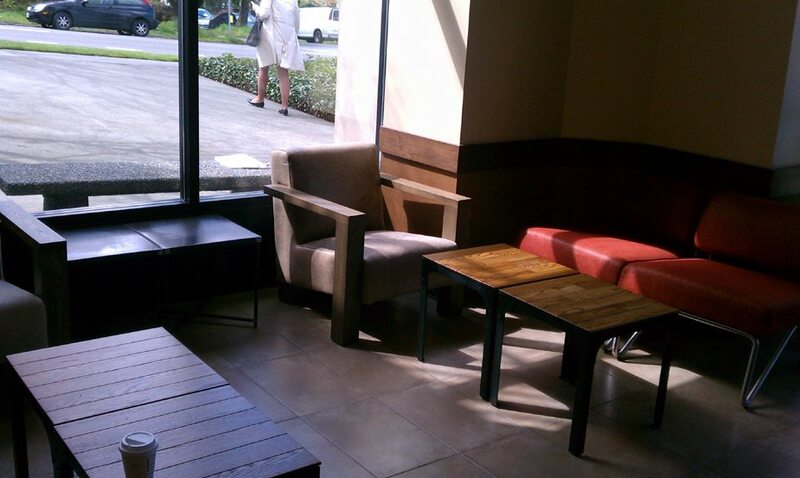 On April 17, 2011, a new (licensed) Starbucks opened up in Seattle, located inside Swedish Medical Center. It might be the first Starbucks in Seattle with the new logo. If anyone knows of a new Starbucks logo in the city of Seattle which was on display before April 17, 2011, please let me know! (The Starbucks located in SODO 8 does not count. I have no doubt it has the new logo, but it is not open to the public!) For those who don’t remember, Starbucks unveiled their new logo on January 5, 2011. In a previous StarbucksMelody.com blog article, Sebastian Birr spotted the new logo in Prague. A New York City blogger (Nick’s Coffee and the City Blog) took some photos of the new logo in Times Square. And for more logo fun, take a look at the new Seattle’s Best Coffee logo on one of their stores at 4th and Spring in Seattle. If you’ve seen the new logo on a Starbucks, do tell! Wow!! 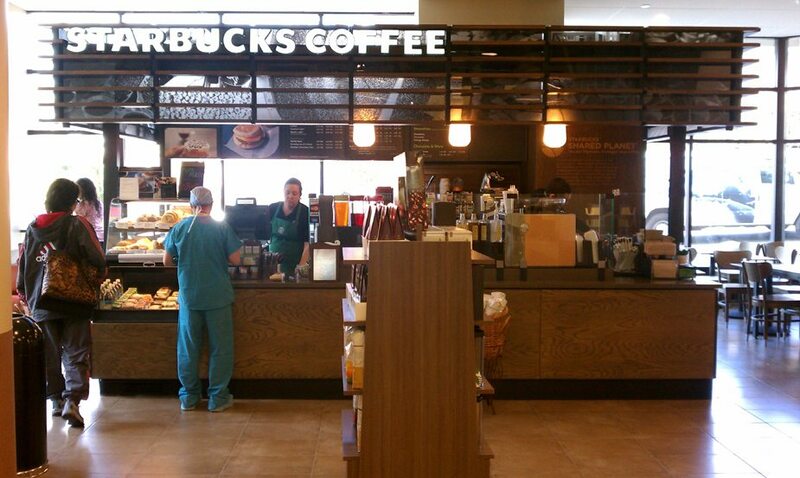 This is a very nice looking store that looks so different to the regular hospital atmosphere. And I really like these new comfy chairs…awesome! What great decor for a licensed store! This so continues to amaze me how the design of stores vary and this is the first time I have seen a licensed store look so good! Re the new logo- have not seen one yet around here. I have yet to see any stores with a new logo…..
@DeniseR @Purple1 @Sebastian – I was almost hoping that there would be others who have seen the new logo around. It was such a surprise to me to find it on a licensed store in Seattle! I know of two new company-operated Starbucks that will open up just outside of Seattle, but those are still several months away. Hopefully someone reading this will weigh in on new stores with the new logo – But it’s funny, I notice that every Saturday my blog traffic crashes. I think most people are enjoying their gorgeous spring weather weeekend and not reading a blog! I should be too! Sorry for the ramble my friends! Melody- a diversion but nice spring weather!! HA! Not here. Back to the logo- I actually thought that the new logo was going to be put up much faster than it is. It sort of confuses me because corporate made such a point of introducing it and now it is hard to find. 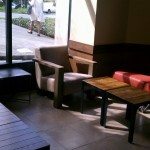 My local SB says they are not replacing the old one. 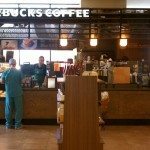 @purple1 – I don’t think your local Starbucks has it right – I think eventually ALL Starbucks will have the new logo, but it might take years and years to get to 17,000 stores. Brand new store openings will have the new logo first because obviously it makes sense that they get it and not an old logo. I know of new stores coming soon in Shoreline, WA area, Cowlitz County WA, one slated for Portland, OR that has been in the news as a black label (I cannot wait to see what their logo looks like), the one in Harvard Square that we both know of. There has been gossip that there will be a new company-operated Starbucks in downtown Seattle, but I haven’t been able to pin anything down. If anyone has a tip, please email me! Melody at StarbucksMelody dot com! Looking for the new logo…it’s going to be like an Easter egg hunt of sorts! 🙂 If I see one I’ll be sure to send a pic and the details! I spoted the new sign in downtown Osaka last week at a new store about to open, but my cell phone was dead. I will take a picture and send it to you when I get back there next week! I feel like I’ve read the same thing Melody, but now I’m not sure where (re the old logo being replaced). If something like this was in my local hospital, it would be such a real 3rd place! I hate being at the hospital, but this looks like a little oasis! I don’t know…it is kind of a weird time, overall. maybe, fot alot of the U.S., it’s the: is it spring/summer or is it a rainy winter??? anyway: Happy Easter to everyone. @ Melody, Yes, I saw and visited the new logo store in NYC (Time Squares) before heading to Seattle last two weeks. This is the only store that I saw in my 2 weeks in US with new logo. In Asia and specific for THAILAND, the recent store which opened last week still decrorated with old logo. Btw, I visited one store in Seattle, called “University Village” (if I am not wrong, it’s closed to one of university campus probably Washington University). This store is very big and very nice too. Just sharing. 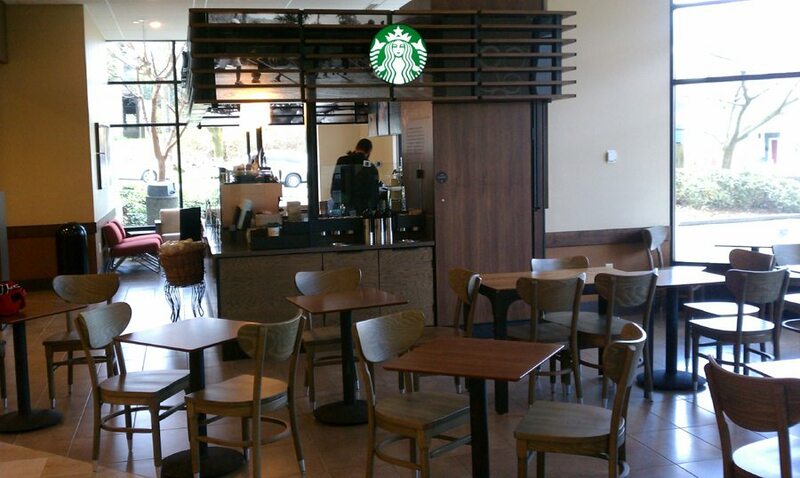 @Annop – Glad you liked University Village Starbucks. It sounds like you’re having fun on your vacation to Seattle. I’ve thought about featuring U Village here on the blog at some point – It’s a beautiful store, but somehow one of the very noisiest in Seattle. It does get on my nerves a bit. WOW! how exciting to see the new logo taking off! I’m also so pleased to see my blog mentioned on your blog! As a new blogger it feels like such an HONOR! 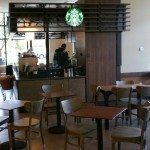 I try to stay diverse in my coffee blog BUT I’m on a HUGE Starbucks kick– ONWARD is really getting me fired up! And there’s so much happening at the Stores in NYC. Howard actually just came to one of the stores IN QUEENS! IN MY NEIGHBORHOOD! But I was told too late… I was totally going to stand outside and ask him to sign my book…. DORKY! I know! But life is too short. You gotta be passionate about SOMETHING! I will def. have to go check this out while I’m in town. Stopped by the SBC on 4th and Spring today, actually. Beautiful store. Still didn’t get anything, so I’ve never even had SBC coffee yet! WAH!